"And those of us who have Synesthesia, (or at least many of us who have one of its variants) get that sort of thing without wearing special glasses. Sound (and some other sensory data) produces color and shape overlays on my vision, as well as a bunch of other crossconnections." "wow, the first thing i thought of when i saw this was Gibson's 'Idoru'. 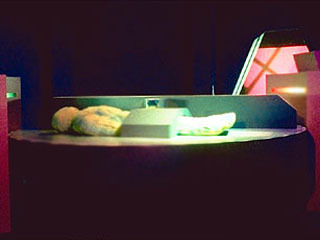 just the idea of an avatar being projected onto a surrogate physical shape. very cool." "Ashley - That sounds like a difficult thing to live with. One sf writer tried re-imagining it as a kind of altered reality experience - see the entry for the twist-box from Rudy Rucker's 1988 novel Wetware." "Jip - That would be cool. You could have a touchable version of your favorite virtual character; an idoru or a synthespian." "The episode "I Dated a Robot" from the sci-fi animated show Futurama also includes a reality-augmenting robot, depicted as a robot replica of Lucy Liu (also voiced by Ms. Liu). 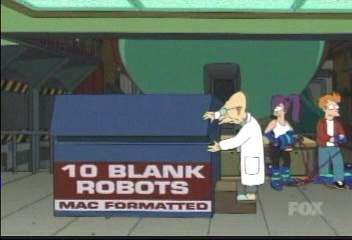 http://en.wikipedia.org/wiki/I_Dated_a_Robot"
"Got it - here are some screen grabs. As I understand it, Lucy's features are actually printed or impressed onto the robot. 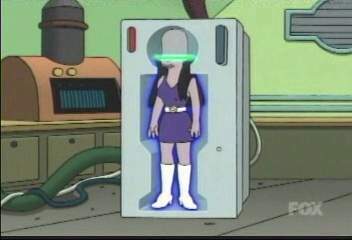 "You young whippersnappers probably don't remember the origin of this Futurama idea - namely, the android creating machine in What Are Little Girls Made Of? from the first season of Star Trek (aired October, 1966). The blank android was placed on one side (shown here) and the person to be duplicated is placed in a corresponding position on the other side. Then, they spun the device like the Wheel of Fortune. Note the excellent fidelity of the process, as demonstrated by Sherry Jackson (second pic). (Sharp-eyed sixties fans will also note Ted Cassidy as Ruk, the 6'9"" android servitor. And yes, he also played Lurch in the original Addams Family.)" "Oh...I've got a lot of information here. When I demonstrated U-Tsu-Shi-O-Mi at SIGGRAPH last year, a guy told me about Futurama. What I imagined there was General Motors Futurama Pavilion. 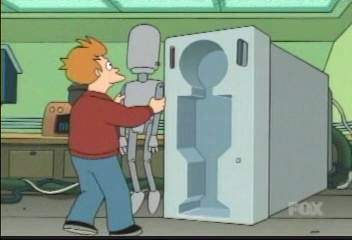 Then, he told me Futurama was TV animation, but we couldn't search and find the images of Lucy Liubot in that time. To tell the truth, the idea of U-Tsu-Shi-O-Mi doesn't come from any kind of science fiction. The idea, 'Robot as Media Player', occurred to me when I saw broken video cassette recorders piled on the shelf in my lab. If you have a time, visit my site http://wingover.jp for more information. Thank you! "